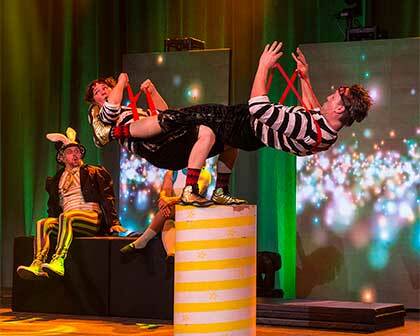 Since 2001, Firefly Theatre & Circus has been the go to place for circus performances in Edmonton. We have performed on the ground and in the air, at corporate events, award shows and galas, on the sides of buildings, on the street, and of course in many of Edmonton’s fabulous theatres. 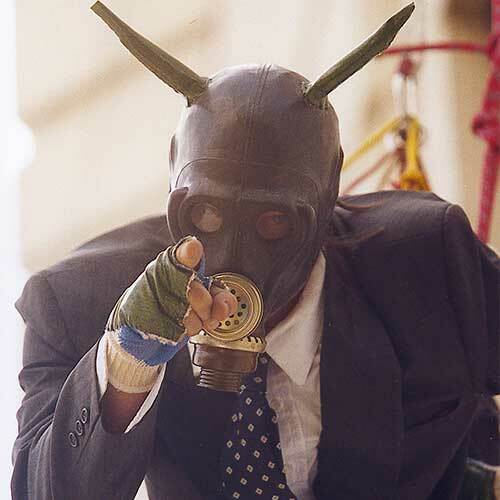 Our corporate entertainment includes both aerial and ground acts, which can be tailored to your event. We love to work with our clients to create the perfect event. Our reputation speaks for itself. Professional high quality entertainment. We also run Edmonton’s first recreational circus training facility. Over the years we have trained hundreds of students. Our staff are trained by our professional staff, with special training workshops both here at home and in many places around the world. Our first goal is safety, with a strong work ethic, and of course FUN! 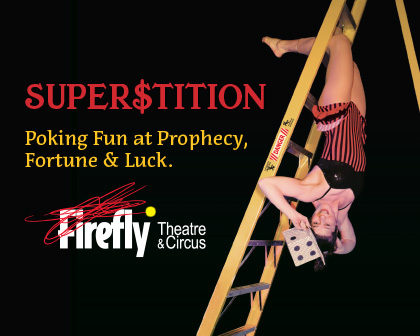 Firefly Theatre returns to the stage at La Cité Francophone with a spectacular circus and magic cabaret about prophecy, fortune and luck. Super$tition will poke fun at the things we believe will bring us luck or ward off evil with our flamboyantly courageous style! Featuring local favourite John Ullyatt, our special guests magician Billy Kidd from the U.K and contortionist Eliza Lance from Montreal, along with our amazing Home Team of circus artists! Don’t miss this show – it’s bad luck! Spring Classes Begin March 31st! Turn your life upside down at Firefly Circus Academy, Alberta’s pioneer Aerial Arts Program. 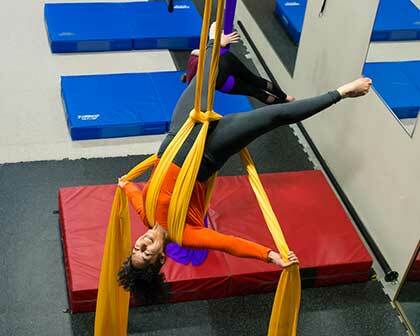 Experience the thrill of learning acrobatic and aerial skills while improving fitness, strength, and flexibility.